It is a mixture of Environmentally Sensible organic solvents, wetting agents and a corrosion inhibitor. A Direct Replacement for Acetone, NMP, MEK, Methylene Chloride, and caustic based cleaners. SURF X FLUSH 2000 ™ Polyurethane Foam & Resin Remover is highly effective in flushing and immersion cleaning of spray equipment, mixing and metering equipment and feed lines, as well as loosening, and removing cured urethane foam deposits and build-up from mixing heads, troughs, conveyor parts, side walls, rollers, foam cutting devices and molds. Due to its low vapor pressure and high boiling point it evaporates 237 times slower than Acetone and MEK; 600 times slower than Methylene Chloride. This means, whatever quantity you purchase, you will use. Enhanced worker safety, environmentally friendly, non-hazardous, non-flammable, non-HAPs, non-Chlorinated,non-Aerosol, BIODEGRADABLE solvent-based cleaner designed to remove Flexible and Rigid TWO COMPONENT Polyurethane Foam Adhesives. It cleans like Acetone & Methylene Chloride without the hazards. Itis effective on both MDI, polyester-polyols and polyether-polyols as well as cured polyurethane adhesives. It provides fast, residue free, and complete removal of cured or uncured rigid urethane foam deposits and buildup from mixing heads, gear pumps, troughs, sidewalls, conveyor parts, rollers, molds, foam cutting devices, holding tanks, feed lines and mixing equipment. This product cleans downto the bare metal surfaces; it is easy to use. In addition, Surf X – Flush™ 2000 eliminates disposal costs by recycling the spent material via vacuum distillation. SURF X FLUSH 2000 ™ DOES NOT CONTAIN any chemicals known to State of California to cause cancer, birth defects, or any other reproductive harm. It DOES NOT CONTAIN any raw materials listed on Section 112 (b) Hazardous Air Pollutants List. 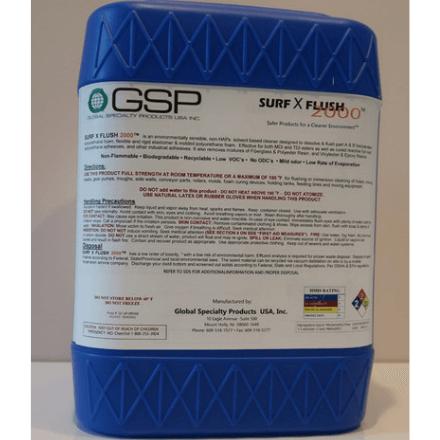 SURF X FLUSH 2000™ (Patent Pending) effectively cleans all types of reacted resin system (part A & B) quickly and effectively without the use of NMP, BLO, Acetone, MEK, and other harmful chemicals. In addition, it offers high resin loading, significant cost savings and hazardous waste elimination in many manufacturing processes. Polyurethane Foam (reacted part A & B Isocyanate & Polyol) – Cleaning of spray equipment, mixing and metering equipment and feed lines, as well as loosening, and removing cured urethane foam deposits and build-up from mixing heads, troughs, conveyor parts, side walls, rollers, foam cutting devices and molds. Filament Winding – cleaning resins from machinery, tools, resin wet out guns, etc. Pultrusion Manufacturing – cleaning guides, pipes, parts, etc. All Surf X Flush 2000 documentation, manuals and resources available HERE.